"CBD: Are you getting what you paid for?" on KCTV5 News Kansas City (February 3, 2019) cites ConsumerLab.com's finding that you can't always rely on labels when choosing a CBD product. In the report, ConsumerLab's president, Tod Cooperman, M.D., explains "I would say at least 30 percent of the labels are accurate. 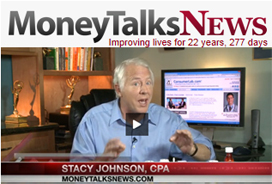 The other 70 percent aren't accurate or are just not telling you on the label what to expect." KCTV5 News also purchased and tested four CBD products sold in Kansas City and found that none contained the amount of CBD listed on its label. The report recommends purchasing only CBD products that have been tested with results that can be verified. Consumer Reports' "Melatonin may not be as safe as you think," on ABC Eyewitness News Chicago (March 19, 2019) discusses potential concerns and side effects of taking melatonin supplements and recommends looking for a melatonin supplement Approved by ConsumerLab.com or other independent testing organization. "Do Gummy Vitamins Work? Here's What Experts Say" in TIME magazine (March 13, 2019) cites ConsumerLab's finding that gummies were the most likely type of multivitamin to fail its tests of quality. In the article, ConsumerLab's president, Tod Cooperman, M.D., explains the issues with gummies, as well as why they typically do not contain iron. In "8 Nutrients You Shouldn't Take in Pill Form" (Reader's Digest, February 16, 2019), ConsumerLab.com's president Tod Cooperman, M.D., explains why supplements such as apple cider vinegar, vitamin D and melatonin are best taken as a liquid, while for others, like vitamin C and folic acid, a pill is best. "Do Gummy Vitamins Work, and Are They Good or Bad for You?" (Healthline, January 30, 2019) discusses the pros and cons of gummy vitamins and cites ConsumerLab's finding that 80% of gummy vitamins -- selected for testing in its Multivitamin Review -- did not provide the amounts of vitamins and minerals listed on their labels. The article recommends choosing a multivitamin with certification from ConsumerLab or other independent testing organization. In "Using CBD products? Beware risk of positive drug test" in The Joplin Globe (December 22, 2018), ConsumerLab.com's president Tod Cooperman, M.D., explains why, although uncommon, taking CBD products can result in a failed drug test. The article also cites ConsumerLab's tests of popular CBD oils and hemp extracts, including the amounts of CBD and THC found they contained -- information that is often not provided on labels. In "How to get enough vitamin D without the sun" in Business Insider (December 17, 2018), JoAnn E. Manson, M.D., Dr.P.H., chief of the division of preventive medicine at Brigham and Women's Hospital and study director of one of the largest ongoing trials on the effects of vitamin D supplementation (the VITAL study), recommends looking for evidence of quality control testing from independent organizations such as ConsumerLab.com when choosing a vitamin D supplement. In the Prevention article "We Looked Into Whether It's Safe to Take Expired Vitamins" (December 21, 2018) ConsumerLab.com's president Tod Cooperman, M.D., explains what expiration, "best by" and "use by" dates on vitamin and supplement labels mean, and how their potency and safety may be affected after these dates. The Academy of Nutrition and Dietetics' (AND) position paper on Micronutrient Supplementation (November 2018) recognizes ConsumerLab.com as an independent organization that evaluates supplement quality. The AND is the world's largest organization of food and nutrition professionals. As the paper explains, it is the AND's position "...that micronutrient supplements are warranted when requirements are not being met through the diet alone. Those with increased requirements secondary to growth, chronic disease, medication use, malabsorption, pregnancy and lactation, and aging may be at particular risk for inadequate dietary intakes. However, the routine and indiscriminate use of micronutrient supplements for the prevention of chronic disease is not recommended, given the lack of available scientific evidence." The article "Current regulatory guidelines and resources to support research of dietary supplements in the United States" by Regan Bailey, Associate Professor of Nutrition Science at Purdue University, cites ConsumerLab as a resource for its independent work comparing "actual analytical levels of product ingredients with the labeled levels for a wide range of product types..." The article also refers to CL's Multivitamin Review, which found quality control problems with 46% of MVM products. The article appears in the November 2018 issue of Critical Reviews in Food Science and Nutrition, a leading nutrition journal. 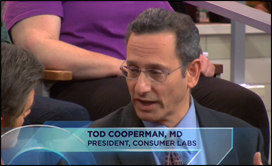 ConsumerLab's president, Tod Cooperman, M.D. 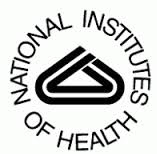 was among the experts speaking at the 2018 Office of Dietary Supplements Research Practicum held at the National Institutes of Health. The talks are now available online through the ODS website. Dr. Cooperman participated in the "Meet the Watchdogs" panel (his talk starts at 16:07 minutes). The Practicum is an annual two-and-a-half-day educational opportunity providing fundamental knowledge of dietary supplements to faculty, students, and practitioners. It emphasizes the importance of scientific investigations to evaluate the efficacy, safety, and value of these products for health promotion and disease prevention as well as how to carry out this type of research. "CBD: A marijuana 'miracle' that comes at a very high price" in the Philadelphia Inquirer (October 23, 2018) cites ConsumerLab's tests of popular CBD products, which found a 10-fold difference in the amount of CBD in products and a 5-fold difference in the cost to get CBD from these products. Also noted is research by Dr. Marcel Bonn-Miller of the University of Pennsylvania. In "The CBD Oil Bloom" segment on Dr. Oz (October 2, 2018), ConsumerLab.com president, Tod Cooperman, M.D. 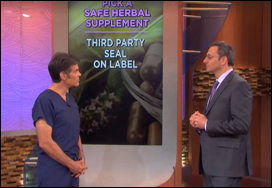 discussed CL's tests of popular CBD and hemp oil products with Dr. Oz and Dr. Sanjay Gupta. CL found some products to contain 10 times more CBD than others. Watch Part 1 and Part 2 of the segment. The article "Calcium Supplements for Osteoporosis" by physical therapist Margaret Martin on MelioGuide.com (October 3, 2018) provides useful information about calcium supplements from an interview with ConsumerLab.com's president, Tod Cooperman, M.D. A video of the interview is also provided. In his article about statins versus red yeast rice for lowering cholesterol, Dr. Zorba Paster cited ConsumerLab.com's tests of red yeast rice supplements (Wisconsin State Journal, October 5, 2018). He also noted that ConsumerLab.com is his "go-to place for up-to-date, great information for any supplement." In "Supplements for Brain Health?" on AARP.org (August 7, 2018) ConsumerLab's Dr. Tod Cooperman discusses the evidence for B vitamins, curcumin (from turmeric), cocoa flavanols and fish oil for improving cognition and memory, as well as key findings from ConsumerLab tests of these supplements and what to look for when choosing a product. Complete findings and CL's Top Picks for each can be found in ConsumerLab's Reviews of B Vitamins, Turmeric and Curcumin Supplements, Dark Chocolates and Cocoa Powders and Fish and Marine Oil Supplements. "Not All Bone Broths Are Healthy" in BottomLine Personal (August 15, 2018) cites ConsumerLab.com's tests and reviews for bone broths. Complete findings (including amounts of collagen found in each product) and CL's Top Picks are found in CL's Bone Broth Review. "Don't Trust the Label on Your Supplements" in Outside magazine (July 5, 2018) features an interview with ConsumerLab.com's president Tod Cooperman, M.D. and others on its scientific staff, including Mark Anderson, Ph.D., Vice President for Research. The article explains the important role that 3rd party testing organizations play in helping consumers find better quality supplements. 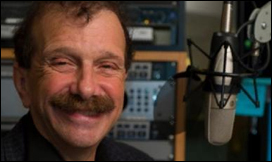 On the Dr. Nieca Goldberg show on SiriusXM's Doctor Radio (June 21, 2018), ConsumerLab's Dr. Tod Cooperman discussed vitamin D and answered questions about what it does, how much to take, and risks. See ConsumerLab's Review of Vitamin D supplements. On SiriusXM's Doctor Radio (May 13, 2018), Internal Medicine host Dr. Ira Breite interviewed Dr. Tod Cooperman of ConsumerLab.com about the cannabidiol oil craze as well as probiotics. See ConsumerLab's reviews of cannabidiol products and probiotic supplements. 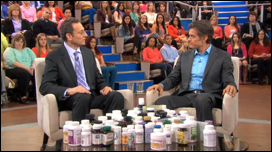 The Dr. Oz Show segment "Is Your Apple Cider Vinegar Real?" (April 30, 2018) featured ConsumerLab.com's recent tests of popular apple cider vinegar bottled liquids and pills. CL found that most apple cider liquids were generally of good quality, but one apple cider vinegar supplement contained potentially dangerous levels of acetic acid. 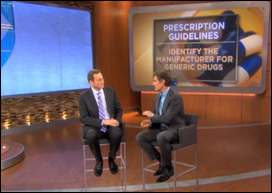 Watch the segment on Dr. Oz's website. ConsumerLab's cocoa flavanol findings (for a Trader Joe's dark chocolate bar) were cited in the study "Effects of Milk vs Dark Chocolate Consumption on Visual Acuity and Contrast Sensitivity" published in JAMA Ophthalmology (April 26, 2018). The small study showed improved vision with dark vs. milk chocolate. Test results, comparisons, and CL's Top Picks among dark chocolate bars, cocoa powders, and cacao nibs are found in CL's Dark Chocolate Review. In "13 Supplement or Medication Combos You Should Never Mix" in Reader's Digest (March 23, 2018), ConsumerLab.com's president Tod Cooperman, M.D., discusses interactions among vitamins, minerals, other supplements, and drugs. "Vitamin and Mineral Supplements – What Clinicians Need to Know" in JAMA (March 6, 2018) by JoAnn E. Manson, MD, DrPH and Shari Bassuk, ScD of Harvard provides general guidance for supplementation by life stage and for high-risk subgroups. The article notes that, "Clinicians and patients should also be aware that the US Food and Drug Administration is not authorized to review dietary supplements for safety and efficacy prior to marketing." It notes that clinicians may want to "...advise patients to consider selecting a supplement that has been certified by independent testers (ConsumerLab.com, US Pharmacopeia, NSF International, or UL) to contain the labeled dose(s) of the active ingredient(s) and not to contain microbes, heavy metals, or other toxins." "Should You Drink Matcha Tea?" in TIME magazine (March 8, 2018) provides a good overview of matcha green tea and discusses ConsumerLab.com's findings from our tests of popular brands of matcha -- determining amounts of beneficial catechins (including EGCG), caffeine, and lead contamination. In "To Our Health: Pros and cons of vitamins and supplements" in the Cloverdale Reveille (March 7, 2019), author Paula Wrenn notes, "If you wish to research the quality of the supplement brand you want to use, a website that can prove helpful in terms of quality is ConsumerLab.com." "Don't Rely on a Gummy Multivitamin If You Can Swallow a Tablet" from Center for Science in the Public Interest (November 27, 2017) notes problems with gummy vitamins uncovered by ConsumerLab.com in its recent Multivitamin Review. The article "What can you do to make your nails grow faster?" from MedicalNewsToday (November 18, 2017) refers to ConsumerLab.com's article "Can vitamin supplements strengthen brittle nails?" Also see CL's Top Pick for biotin supplements for hair and nails. "What Are Greens Powders – and Do You Need Them?" in U.S. News & World Report (November 17, 2017) cites ConsumerLab.com's findings of lead and arsenic in some greens powders. The article "Nearly 50% Of Multivitamins Don't Live Up to Their Claims" in Men's Health magazine (November 15, 2017) cites ConsumerLab.com's recent tests of multivitamin supplements, which found that many popular multivitamins contained too much or too little of listed ingredients, or failed to disintegrate in time – with gummies and large tablets most likely to fail. The article also explains how to find the best multi for you, based on ConsumerLab.com's findings. In "How Can You Choose a Good Supplement," on The People's Pharmacy (November 12, 2017), Terry Graedon recommends ConsumerLab as a good resource, adding that its information "... can be crucial for finding a good supplement." The article cites CL's recent multivitamin review in which 46 percent fell short and gummy multivitamins were especially problematic. On Food Sleuth Radio (from Public Radio Exchange – PRX, October 26, 2017), host Melinda Hemmelgarn, M.S., R.D. 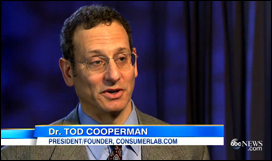 interviewed ConsumerLab.com's president, Tod Cooperman, M.D., noting "I cannot promote ConsumerLab enough... I believe it is the #1 source for dieticians and physicians for sorting truth from fiction and finding out which supplements include their ingredients and perform as manufacturers claim." The interview covers supplements promoted to slow macular degeneration (lutein), boost mood (lithium), and reduce depression, as well as the latest on magnesium, calcium, omega-3 fatty acids, vitamin D, vitamin K, chocolate and cocoa safety, and more. 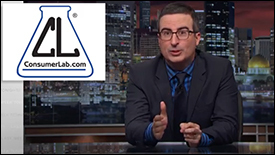 On Last Week Tonight with John Oliver (July 30, 2017), ConsumerLab.com's Vitamin D Supplements Review was mentioned to compare the very low cost of a CL Approved vitamin D3 supplement to the much higher cost of a product promoted online. (CL is mentioned 14 minutes into the broadcast). In the article, "Your chances of choosing a cocoa product with lots of flavanols," on NutritionAction.com (July 24, 2017), ConsumerLab's recent findings with cocoa powders and dark chocolates are discussed. NutritionAction is published by the nonprofit Center for Science in the Public Interest. The latest red yeast rice research and ConsumerLab.com's findings with marketed red yeast rice supplements were recently discussed with Terry and Joe Graedon of The People's Pharmacy (July 18, 2017)in an interview with Tod Cooperman, M.D. of ConsumerLab.com. You can listen to the show online now: It's show #1086 and the interview starts at minute 7:23. In the online radio broadcast "Straight Facts About Supplements" (The Autoimmune Hour on Life Interrupted Radio, June 23, 2017) ConsumerLab.com's President, Tod Cooperman, M.D. explains why one out of 4 supplements you buy may not meet minimum standards, discusses popular misconceptions about supplements like vitamin D, fish oil, calcium, magnesium, folic acid and melatonin -- and what you need to know before you take them. A "Review of ConsumerLab.com" in the Journal of Consumer Health on the Internet (2017, Vol. 21, No. 1) describes CL's information as "current, thorough, unbiased, and rigorous." It concludes that "ConsumerLab.com fills a vital gap in our current consumer protection infrastructure." The review also notes that "This database of thorough and unbiased reports is available for a modest site license fee to libraries as well as a very reasonable individual membership rate." The review was written by Kay Hogan Smith, MLS, MPH, CHES, Professor/Senior Research Librarian, UAB Libraries-Lister Hill Library of the Health Sciences. The article "Are there any supplements that can help prevent or treat a cold?" (Philly.com, January 18, 2017), ConsumerLab.com's President, Tod Cooperman, M.D., discusses the evidence for supplements such as zinc, probiotics, Echinacea, vitamin C.
The article "No Evidence of Aloe Vera Found in the Aloe Vera at Wal-Mart, CVS" (Bloomberg, November 22, 2016) cites findings from ConsumerLab.com's Aloe Products Review, which found only half of the selected products contained what was expected from labels. Bloomberg commissioned its own tests of house brand products similar to one which failed CL's review, finding no evidence of aloe vera in three of them. CL's President, Tod Cooperman, M.D. is quoted in the article as saying "You have to be very careful when you select and use aloe products." In an article from Consumer Reports about "Supplement Seals" (July 28, 2016) a comparison chart shows that only ConsumerLab.com purchases its initial test samples in stores, while U.S. Pharmacopeia, NSF International, and UL obtain samples from the manufacturer. This allows ConsumerLab.com to assess a product's quality at the time of purchase, like a consumer, and avoid possible misrepresentations by manufacturers. The article notes that ConsumerLab.com is one of the three organizations which "have long histories of certifying supplements." ConsumerLab.com is also the only group which freely publishes its testing methods and criteria. In the video, "The Pros and Cons of Probiotics" on Reuters Health Watch (July 13, 2016), ConsumerLab.com's President, Tod Cooperman, M.D., discusses probiotic supplements and provides tips on what to look for on probiotic labels and how to best store these supplements. Also see ConsumerLab.com's Probiotic Supplements Review for the latest tests of popular products. In "Here's What's Really In Your Multivitamin" on Reuters Health Watch (June 16, 2016), ConsumerLab.com's President, Tod Cooperman, M.D. discusses issues with multivitamins and their use. Also see ConsumerLab.com's Multivitamin Review for the latest product-specific findings. "Pet Health Supplements Fall Short of Label Claims: Study" on Newsmax (June 16, 2016) reports on ConsumerLab.com's recent finding that many of the supplements given to dogs and cats don't meet the claims manufacturers make on the labels. In fact, one contained none of its listed chondroitin and another provided only 8% of its listed amount (see CL's Joint Health Supplements for Pets Review). Other types of supplements for pets which ConsumerLab.com has tested include Multivitamins, Fish Oils, Flaxseed and Other Seed Oils, and Probiotics. For the fifth year, ConsumerLab.com president, Tod Cooperman, M.D., was asked by the U.S. National Institutes of Health (NIH) to talk to nutrition researchers as part of the 2016 Dietary Supplement Research Practicum offered by the Office of Dietary Supplements in June. As part of the "Meet the Watchdogs" panel, Dr. Cooperman was joined by David Schardt of Center for Science in the Public Interest and Anahad O'Connor, consumer health reporter for The New York Times. The practicum is an intensive program to provide fundamental knowledge of dietary supplements to faculty and post-doc students at academic institutions; healthcare practitioners; and others with advanced biomedical degrees. "Is This All-Natural Supplement The Key To Slimming Down?" on CBS New York (May 16, 2016) reports on Garcinia cambogia and ConsumerLab.com's tests of Garcinia supplements which found that more than half did not contain their expected ingredients. The story also mentions matcha green tea, which ConsumerLab.com has tested. "Do Probiotic Products Live Up to Their Promises?" on Sonima.com weighs the pros and cons of getting your probiotics from foods versus supplements. The article cites ConsumerLab.com's tests of popular probiotic supplements and kefirs (cultured milk drinks) and quotes CL president Tod Cooperman, M.D., who advises: "Supplements can be fine, but there is a risk they were not shipped or stored properly." See CL's test results, plus advice for buying and storing probiotics, in the Review of Probiotic Supplements and Kefirs. In the book, "Dr. Carol's Guide to Women's Health" (Siloam 2016), Carol Peters-Tanksley, MD, Dmin, recommends ConsumerLab.com, writing, "If you regularly take supplements, consider subscribing to this inexpensive and informative resource available at www.consumerlab.com." The Guide offers medical science, the author's practical experience, and a faith perspective (Dr. Carol is an ordained Christian minister) to the physical and mental health issues women face throughout the various stages of their lives. In "The Science of Natural Healing," a 24-lecture series offered by The Great Courses, Mimi Guarneri, M.D., Founder of the Scripps Center for Integrative Medicine, recommends ConsumerLab.com, noting that she uses ConsumerLab.com "When I'm looking for the best product for my patient." Describing ConsumerLab, Dr. Guarneri notes, "They will actually go into the stores, take the bottles off the shelf and test them. They want to know, 'Does the supplement have the strength, composition, identify and purity that it says on the label.'" The series provides useful information about supplements and how they are used with diet, other forms of natural healing, and modern medicine, to lower cholesterol, treat high blood pressure, treat diabetes, reduce stress, and deal with food sensitivities. The article "Dog Meds: From Supplements to Compounded Drugs and Generics" in The Bark (March 18, 2016) cites ConsumerLab.com's tests of products for dogs, describing the "buyer-beware" situation. ConsumerLab.com tests of pet supplements include Multivitamins, Probiotics, Fish Oils, Seed Oils, and those for Joint Health. "100 LivingHealthy Facts to Know" on the LivingHealthy.com website (January 18, 2016), lists ConsumerLab.com as a resource as well as the basis for facts #17 to #22. You can also take the LivingHealthy IQ test -- see if you can spot the CL Seal of Approved Quality! 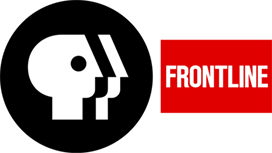 A Frontline report "Supplements and Safety" aired on PBS on January 19, 2016 and provided additional information online, including "Five Questions to Ask When Considering Health Supplements." The answer to the question "Has the product been tested by independent labs?" suggests ConsumerLab.com as a resource. The Journal of the Academy of Nutrition and Dietetics (January 2016) published "Quality Certification Programs for Dietary Supplements," an article comparing the three major U.S. certification programs: ConsumerLab.com, NSF International, and USP. The article describes the programs and the standards they follow. As the article indicates, ConsumerLab.com, started in 1999, is the oldest of the three programs and the only to freely publish its testing methodology and approval criteria, as well as publish independent product reviews. The lead author of the article is Sharon R. Akabas, PhD, of the Institute of Human Nutrition at Columbia University. The article "Comprehensive Performance Nutrition for Special Operations Forces" in the Journal of Special Operations Medicine (Vol. 15, Issue 4, Winter 2015, pp. 40-53) lists ConsumerLab.com as a resource for dietary supplement evaluation. The article focuses on developing and systematically implementing a comprehensive nutrition program for special operations forces. The lead author is Karen A. Daigle, MS, RD, CSSD, CSCS, a specialist in human performance optimization at the elite level. In The New York Times article "Vitamin Expiration Dates" (Well Blog, July 20, 2015) ConsumerLab.com president Tod Cooperman, M.D. explains "use by" and "best by" dates on supplement labels and what they indicate about vitamin potency and safety. He also explains the best way to store supplements, such as probiotics. At the 2015 Florida Academy of Nutrition and Dietetics (FAND) Annual Symposium in Orlando, ConsumerLab.com's President, Tod Cooperman, M.D., was an invited speaker on July 14, giving a one-hour presentation to nutrition professionals entitled "Everything You Always Wanted to Know About Supplements (But Were Afraid to Ask)." The mission of FAND is to empower its members to promote optimal nutrition and health for all people. The article "Is There Cadmium in Your Cocoa?" (July 8, 2015) on BerkeleyWellness.com cites ConsumerLab.com's tests of popular cocoa powders, dark chocolate bars and supplements which found many cocoa powders to exceed contamination limits for cadmium and/or lead. The Berkeley article explains why cadmium is found in cocoa, and gives recommendations for minimizing the risk when consuming cocoa and chocolate. BerkeleyWellness.com is the website of the Berkeley Wellness Newsletter, which is associated with the School of Public Health at the University of California, Berkeley. 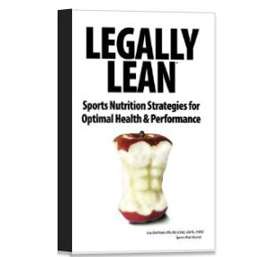 Legally Lean, by Lisa Dorfman, the Running Nutritionist©, is a new book for athletes looking to improve their health and performance. Ms. Dorfman is a registered dietician and former professional triathlete. Ms. Dorfman lists ConsumerLab.com as a resource in the book, noting that it is "one of my favorite go-to websites for gathering the latest information on supplement-specific purity, safety, efficacy, and quality." Her strategies are science-based, sensible, and user-friendly. Her tips on when and how to use supplements are right on target. (Legally Lean, Sports Nutrition Strategies for Optimal Health & Performance, Momentum Media 2015). 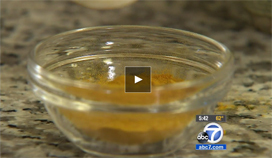 "Lab Tests Find Insect Parts, Larvae in Dried Turmeric Spices" on ABC7 Eyewitness News - Los Angeles (May 8, 2015) featured results from ConsumerLab.com's Product Review of Turmeric and Curcumin Supplements and Spices. In addition to the filth found in popular spice brands, some supplements contained much less curcumin than expected from labels. 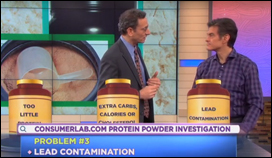 On The Dr. Oz Show (May 1, 2015) ConsumerLab.com president Dr. Tod Cooperman discussed the CL tests that helped Dr. Oz expose herbal weight management supplements which contained little of the key ingredients which CL expected from their labels, such as Garcinia cambogia and green coffee bean extract. 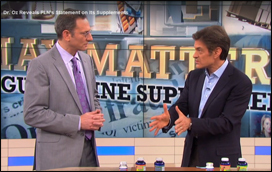 Read Dr. Cooperman's article "Why You Need to Be Extra Careful with Supplements for Weight" on the Oz website and watch Part I and Part 2 of the segment "Dr. Oz Investigates Online Scams Using His Name to Dupe You" (results of CL's tests are in Part 2). Dietary supplement retailer GNC has entered into an agreement with the New York Attorney General's Office to perform additional tests on its products, including DNA barcode testing of the plants used to make herbal supplements. A press release issued by the office of the New York Attorney General (March 30 2015) included reactions to the agreement from a number of experts in the areas of nutrition and dietary supplements, including ConsumerLab.com President, Tod Cooperman, M.D., who noted "The additional tests outlined by this agreement are a positive step toward making sure that herbal supplements are actually made from the plants on their labels." 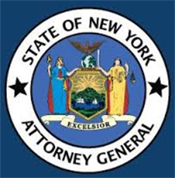 The announcement follows the New York Attorney General's February 2015 report which found problems with herbal supplements sold by major retailers, including GNC. On The People's Pharmacy radio show Herbal Supplements Put to the Test (March 14 2015) ConsumerLab.com president Dr. Tod Cooperman discussed what the New York Attorney General's recent report on faulty dietary supplements does â€“ and does not â€“ reveal about the products that were tested. Dr. Cooperman explains the importance of using appropriate testing methods, which methods are used by ConsumerLab.com and why, and steps consumers can take to avoid problem supplements. You can listen to the full show here (segment begins around minute 7). The article, "Probiotics Pros and Cons," (March 3, 2015) on BerkeleyWellness.com cites ConsumerLab.com's tests of popular probiotic supplements which found some to contain lower amounts of organisms than listed on the label. The Berkeley article provides an overview of current evidence for various uses of probiotics, including digestion, weight loss and oral health. BerkeleyWellness.com is the website of the Berkeley Wellness Newsletter, which is associated with the School of Public Health at the University of California, Berkeley. On NPR's The Diane Rehm Show (February 26, 2015) Vitamania author Catherine Price warned consumers not to rely on labels when trying to choose a supplement, citing ConsumerLab.com's tests of aloe, garlic and ashwagandha supplements which found many did not contain what was claimed. Price recommended checking supplements with a third party organization, noting "I particularly like a company called ConsumerLab.comâ€¦ it is one of the only companies that actually pulls products randomly off store shelves and evaluates them to see if they have what they say they have." You can listen to the full show here (ConsumerLab.com first mentioned around minute 21). Vitamania, by award-winning journalist, Catherine Price, is a new "must read" book for anyone interested in nutrition. In Vitamania, Price recommends ConsumerLab.com, describing it as a "particularly excellent resource." The book is a fascinating, deep dive into the history of vitamin discovery, vitamin crazes, and vitamin politics. It shows that just when we feel we fully understand our nutritional needs, new discoveries prove us wrong â€“ impressing on us the importance of maintaining an open and discerning mind regarding foods and supplements. (VITAMANIA: Our Obsessive Quest for Nutritional Perfection, Penguin Press 2015). The New York Times article "Knowing What's in Your Supplements" (Well Blog, February 12, 2015) recommends checking ConsumerLab.com's product reviews when trying to ensure a supplement contains what it claims on the label, after a New York Attorney General's report earlier in the month raised questions about the quality of supplements sold my several major retailers. An NBC News' Today article asks "Which vitamins and herbal supplements can you trust?" (February 3, 2015). The article comes in the wake of the New York Attorney General's report about faulty herbal supplements sold by major retailers. 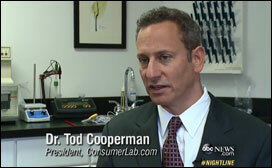 In the Today article, ConsumerLab.com President, Tod Cooperman, M.D. explains potential problems with herbal supplements and how to avoid them. The article recommends looking for ConsumerLab.com approval, or other third-party certification, before buying a supplement. 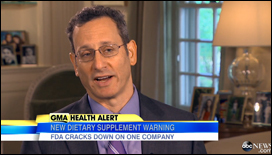 In the ABC News' Good Morning America segment "Herbal Supplements Crackdown: Some Brands May Be Misleading," (February 2, 2015) ConsumerLab.com President, Tod Cooperman, M.D. commented on the danger of unlisted ingredients in herbal supplements. 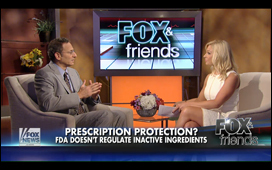 The segment was triggered by a report from the New York Attorney General suggesting that some major supplement brands do not contain what they claim and may contain unlisted ingredients. In the Runner's World article "Herbal Supplements May Not Contain What You Think" (February 4, 2015), Leslie Bonci, the director of sports nutrition at the UPMC Center for Sports Medicine, suggests consumers look at ConsumerLab.com for its ratings of products. (Also see the article in SHAPE "New York Attorney General Says Labels on Supplements May Be Lying" (February 4, 2014), which includes tips about supplements from ConsumerLab.com's president). In "Can I stop taking fish oil?" in the Washington Post (Nutrition Q&A, January 21, 2015), nutrition author Catherine Price recommends ConsumerLab.com when trying to choose a quality fish oil supplement, citing ConsumerLab.com tests of fish oil supplements. At the China International Nutrition and Health Summit 2014 in Beijing in November, ConsumerLab.com's President, Tod Cooperman, M.D., and its Chief Scientific Office for China, Dr. Yongchao Li, presented findings from CL's tests of dietary supplements in the U.S. and announced the upcoming launch of its Chinese-language website - cn.consumerlab.com. The ABC News Good Morning America report "FDA Cracks Down on Dietary Supplement Company" (November 7, 2014) discussed the problem of heavy metal contamination in herbal supplements ( which are not required to receive FDA approval before being sold on the market) and the FDA's recent lawsuit against one supplement company for failing to heed numerous warnings that it was manufacturing and distributing adulterated supplements. In the report, ConsumerLab.com president Tod Cooperman, M.D., warned consumers that approximately 20- 25% of supplements the company reviews fail testing, often because they don't contain as much ingredient as claimed, or are contaminated with heavy metals. He noted that herbal supplements are more likely to exceed heavy metal limits than other types of supplements. A new study found that providing access to ConsumerLab.com as part of a "toolkit" to nurse practitioners improved their knowledge and their guidance of patients regarding the use of natural health products. The study was published in the Journal of Pediatric Health Care (Gutierrez, 2014), the official publication of the National Association of Pediatric Nurse Practitioners. ConsumerLab.com at Food and Nutrition Conference and Expo – ConsumerLab.com's president, Tod Cooperman, M.D., spoke on October 19 about the quality of dietary supplements at FNCE 2014 in Atlanta, run by the Academy of Nutrition and Dietetics. Dr. Cooperman spoke to hundreds of dietitian nutritionists along with noted sports nutritionist, Lisa Dorfman, R.D, focusing on supplements in integrative sports nutrition. The presentations are online. The article "Cocoa Powders Found to Contain a Toxic Metal" on Prevention.com (August 2014) featured findings from ConsumerLab.com's Garcinia Cocoa Powders, Extracts, Nibs, and Chocolate Review. In Goop.com's article "Demystifying the Diet" (July 17, 2014) nutritionist Kelly Dorfman discusses quality issues with multivitamin supplements and notes how difficult it can be for consumers to evaluate ingredient quality without independent information. She recommends subscribing to ConsumerLab.com when trying to compare ingredients and find a quality multivitamin supplement. (See ConsumerLab.com's Multivitamin Review now for tests and quality comparisons). The article "Fish Oil Boosts Brain Power" on Yahoo Health (July 16, 2014) discusses a study suggesting a benefit of fish oil supplementation in preventing cognitive decline (recently reported by ConsumerLab.com in the Fish Oil Supplements Review) and recommends ConsumerLab.com as a resource for choosing the best fish oil supplement. The article "Are Cocoa and Chocolate a Reliable Source of Flavanols?" in Nutrition Action.com (July 1, 2014) refers to ConsumerLab.com's recent test of these products (See CL's Review of Cocoa Powders, Extracts, and Chocolate – Sources of Flavanols). The author, David Schardt, Senior Nutritionist with Center for Science in the Public Interest, points out, "This is the first time that flavanol levels in commercial products have been made public." Dr. Zorba Paster, a syndicated health journalist, referred to ConsumerLab.com as his "favorite online source" for checking the quality of products in a recent article about protein shakes in the Quad City Times (June 20, 2014). Dr. Paster is also heard on public radio at Zorba Paster On Your Health. 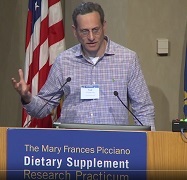 For the fourth year in a row, ConsumerLab.com president, Tod Cooperman, M.D., was asked by the U.S. National Institutes of Health (NIH) to talk to nutrition researchers as part of the 2014 Dietary Supplement Research Practicum offered by the Office of Dietary Supplements in June. As part of the "Meet the Watchdogs" panel, Dr. Cooperman was joined by David Schardt of Center for Science in the Public Interest and others. The annual practicum is an intensive program to provide fundamental knowledge of dietary supplements to faculty and post-doc students at academic institutions; healthcare practitioners; and others with advanced biomedical degrees. The article "How to boost your heart and brain health with fish oil" in USA Today (February 12, 2014) discusses the latest clinical findings for fish oil and cites results of ConsumerLab.com's Fish Oil Supplements Review. The article "Probiotics can enhance health, but what are effective doses?" 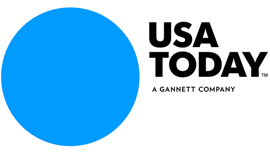 on the Philadelphia Inquirer's website philly.com (January 26, 2014) cites statistics from ConsumerLab.com's Vitamin and Supplement Users Survey and test findings from its Probiotic Supplements Review. The article includes recommendations from various experts regarding the use probiotics. The article "The Diet Pill That's Scamming You" on Prevention.com (November 2013) featured findings from ConsumerLab.com's Garcinia Cambogia Supplements Review. In the article "Beware the Impurities in 'Natural' Supplements" in The Wall Street Journal (November 20, 2013), Dr. Murali Doraiswamy, a professor of medicine at Duke University Medical Center, writes, "Readers can turn to ConsumerLab.com to see purity results for specific herbal brands." On NPR's Science Friday (November 8, 2013), two experts, David Schardt, Senior Scientist at Center for Science in the Public Interest, and Victoria Maizes, M.D., Executive Director of the Arizona Center for Integrative Medicine, each recommended ConsumerLab.com as a resource when trying to choose among herbal and other supplements. ConsumerLab.com is mentioned at 6 and 8 minutes into the segment "Navigating Dietary Supplement Regulations." The article "Herbal-Supplement Scam: Tests Reveal Fake and Dangerous Ingredients" on Yahoo! Shine (November 4, 2013) recommends ConsumerLab.com as a resource to research herbal supplements. ConsumerLab.com's president, Tod Cooperman, M.D., was asked by the Institute of Human Nutrition at Columbia University's College of Physicians and Surgeons to talk to physicians, dieticians, nutrition researchers, and students at its Micronutrient Supplement Symposium on October 26, 2013 in New York City. Dr. Cooperman spoke on the "Evaluation of Supplement Quality and Safety" and participated in a panel discussion. The goal of the symposium, which was attended by more than 600 individuals, was to "better understand how to counsel patients about dietary patterns and supplement use" and "close the gap on shortfall nutrients." Presenting at the FDA on June 21, 2013, ConsumerLab.com president, Tod Cooperman, M.D., asked the Office of Generic Drugs for more transparency and honesty regarding generic drug approvals and labeling. Other presenters at the FDA Generic Drug Regulatory Science Initiatives Public Meeting in Silver Spring, MD included FDA officials, industry representatives, and researchers in the generic drug field. The presentations and slides can be watched online — Dr. Cooperman's presentation is in "Part 1" at the 1:16:30 time mark. The New York Times article "What's in Your Green Tea?" in its "Well" blog (May 23, 2013) featured recent findings from ConsumerLab.com's tests of brewable green tea, bottled green tea, and green tea supplements. In the Wall Street Journal's MarketWatch article 10 Things Vitamin Makers Won't Say (April 30, 2013), ConsumerLab.com president Dr. Tod Cooperman describes common problems with supplement quality and advises consumers to be wary of labels that use certain key words and phrases, which can be used to obscure the exact amounts of expensive ingredients, like chondroitin. 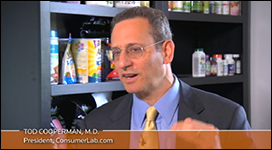 ConsumerLab.com president Dr. Tod Cooperman spoke with Whole Psychiatry radio show host Dr. Robert Hedaya (April 2, 2013) about the reasons for taking a supplement, and how to choose the right one while avoiding common quality pitfalls. You can listen to the broadcast "How to Select a Vitamin Supplement." A study of controlled-release melatonin formulas funded by the U.S. National Institutes of Health (NIH) utilized ConsumerLab.com to assess the dissolution and purity of the tested melatonin products (Gooneratne, J Pineal Res 2012). One of the interesting findings from the study was that higher dose melatonin caused blood levels to remain elevated for longer than the typical sleep period â€“ increasing the risk of daytime drowsiness, as noted in the Concerns and Cautions section of the Melatonin Supplements Review. In "What Is In Your Vitamin Supplements," (March 18, 2012) All Seasons Cyclist (a website for avid cyclists) published a review of ConsumerLab.com, putting a subscription to ConsumerLab.com in its "highly recommended" category. USA Today's article "Vitamin D Doses Often Don't Match Labels, Study Says" (February 11, 2013) reports that a study by researchers at Kaiser-Permanente found amounts of vitamin D in supplements to range from 9% to 140% of what was listed on bottles. It notes that ConsumerLab.com has found similar findings (see the Vitamin D Supplements Review). The article "Probiotics Benefits May Be More Than A Gut Feeling" in The Wall Street Journal's Your Health column (November 26, 2012) cited ConsumerLab.com's latest review of probiotic supplements, which revealed that two out of 12 products selected for testing had fewer viable probiotic organisms than expected from the label. The article "Flavor in Curry Favored by Some for Joint Pain" in The Wall Street Journal's Aches & Claims column (July 16, 2012) cited ConsumerLab.com's latest review of turmeric and curcumin supplements, which revealed that two out of 10 products selected for testing had fewer active compounds than expected from the label. The Chicago Tribune highlighted ConsumerLab.com's role as an independent source of dietary supplement information in "Dietary Supplements: Manufacturing Troubles Widespread, FDA Inspections Show" (June 30, 2012). 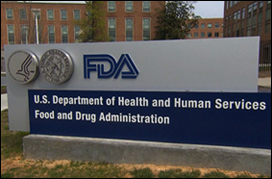 The article details a number of manufacturing violations uncovered by the FDA since it began new industry compliance inspections in 2008. 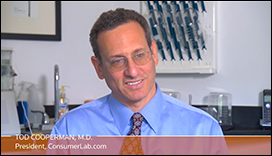 ConsumerLab.com president Tod Cooperman, M.D., explains that significant problems have been found with approximately one out of every four products the company has tested and describes some of the reasons for this. In a related piece, "Dietary Supplement Tips for Consumers," the Chicago Tribune recommends ConsumerLab.com, along with sites such as FDA.gov, to readers who want to "minimize their risk," when it comes to choosing and using a dietary supplement. "The Supplement Everyone Needs to Take," published by Rodale.com (May 2012) reports on a study which found fish oil supplementation reduced cardiovascular stress due to air pollution. The article suggests that people consult ConsumerLab.com's tests of fish oil supplements when choosing a supplement. The New York Times "Well" column cited ConsumerLab.com's study of coconut waters in an article "Really? The Claim: For Better Hydration, Drink Coconut Water" (August 8, 2011). Responding to a consumer's question about natural cholesterol control on the drweil.com website (June 30, 2011), Andrew Weil, M.D. noted that the most effective natural product available to help lower LDL cholesterol is red yeast rice. He commented that some products are less effective than others and suggested that consumers see ConsumerLab.com's ratings of red yeast rice products. The Wall Street Journal's Health Journal cited ConsumerLab.com's latest test results in the article "Multivitamins: So Many Types, So Many Labels" (June 21, 2011). The article explored the need for multivitamins, the discrepancy between Daily Value figures on products and the latest recommended intake levels, and the reliability of label information. In its article "4 Dietary Supplement Myths Busted," Eating Well magazine (July 2011) cites ConsumerLab.com's research to bust the myth that "What's listed on the label is what's really in the product." In an article about herbal remedies in a local edition of the Chicago Tribune (June 10, 2011), Dr. Leslie Mendoza Temple, M.D., Director of the Integrative Medicine at NorthShore University HealthSystem, recommended ConsumerLab.com as a "good resource for people looking to learn more about herbs and supplements as well as to compare different supplement brands." In a web chat on cancer and nutrition hosted by the Daily Press in Virginia (April 28, 2011), certified oncology dietician Lynne Groeger of the Peninsula Cancer Institute was asked to name the most important/trustworthy supplements. In her response, Groeger noted, "I use ConsumerLab.com to help make decisions about good supplements." ConsumerLab.com, featured in Prevention Magazine article on Yahoo! Health (Feb. 4, 2011) providing insights into the 5 most popular supplements in the recent CL Survey: fish oil, multivitamins, vitamin D, calcium and CoQ10. 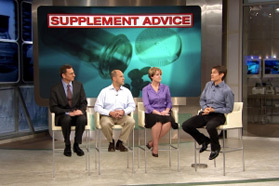 Dr. Cooperman, ConsumerLab.com President, featured in Prevention Magazine article on MSNBC.com (January 17, 2011) where he discusses the safety concerns surrounding online diet pills. 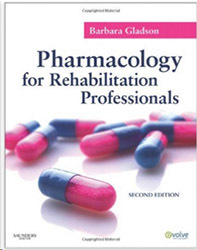 Pharmacology for Rehabilitation Professionals, 2nd Edition (Saunders 2010) by Barbara Gladson, PhD TP OTR, suggests that, when buying supplements, you should check independent tests of quality by ConsumerLab.com. The book explains how various drugs affect patients during therapeutic exercise and includes a chapter on complementary and alternative medicine. 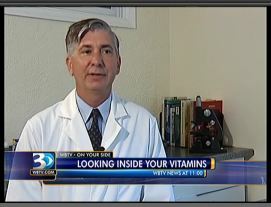 Dr. William Obermeyer, Vice President of Research at ConsumerLab.com featured on CBS News affiliate stations (November 10, 2010) discussing the verification process ConsumerLab.com uses for its independent tests on vitamins and supplements. "One excellent Web site for checking out various supplement brands is www.consumerlab.com, an independent firm that tests supplements to determine if they contain the promised ingredients. Detailed reports are available for a fee. Products that pass ConsumerLab's testing may carry the CL seal on their labels." 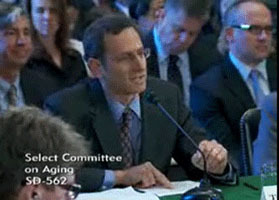 Tod Cooperman, MD gave expert testimony before the Senate Special Committee on Aging regarding the quality of dietary supplements on May 26, 2010. Dr. Cooperman's testimony starts at 38:00. The American Medical Association's Archives of Internal Medicine journal (October 25, 2010) published a peer-reviewed article based on ConsumerLab.com's testing of red yeast rice supplements. The article is authored by Ram Gordon, M.D. and David Becker, M.D., both of the University of Pennsylvania Health System, and ConsumerLab.com's Tod Cooperman, M.D. and William Obermeyer, Ph.D. Data in the article includes results from ConsumerLab.com's Product Review of Red Yeast Rice Supplements (2008). ConsumerLab.com is scheduled to publish its next review of red yeast rice supplements in 2011. 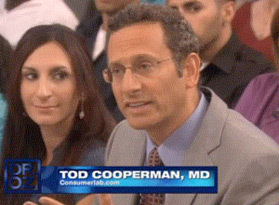 Tod Cooperman, MD , President of ConsumerLab.com discussed fish oil supplements on The Dr. Oz Show (September 26, 2010). 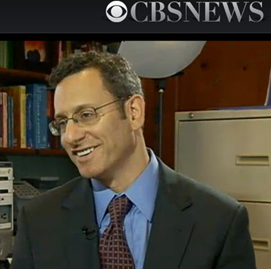 Tod Cooperman, MD (left), President of ConsumerLab.com, appeared on The Dr. Oz Show to discuss problems that can occur with dietary supplements (April 27, 2010). ConsumerLab.com appreciates the coverage it has received from many news organizations including those listed below. For a list of news releases from CL click here. Boston Globe, Chicago Sun-Times, Chicago Tribune, Gannett News Service, Investor's Business Daily, Minneapolis Star Tribune, Newsday, New York Post, Pittsburgh Post-Gazette, Reno Gazette-Journal, San Francisco Chronicle, Stars and Stripes, The Arizona Republic, The Atlanta Constitution, The Atlanta Journal-Constitution, The Baltimore Sun, The Christian Science Monitor, The Detroit Free Press, The Hartford Courant, The Journal News, The Los Angeles Times, The New York Times, The Oregonian, The Orlando Sentinel, The Seattle Times Magazine, The Tampa Tribune, The Wall Street Journal, The Washington Post, USA Today, and Wilmington Morning Star. "Eye on the Internet" (KRLD 1080/Dallas-Fort Worth); Focus on the Family with Dr. James Dobson; National Public Radio (NPR) All Things Considered, Morning Edition, and Talk of the Nation; The People's Pharmacy (Public Radio); Leonard Lopate Show (WNYC - New York); HealthTalk with Dr. Hoffman (WOR). ABC News 20/20, CBS Evening News with Dan Rather, CNN Headline News, and NBC Today Show and Weekend Today Show. American Journal of Nursing, Complementary Practice of Alternative Medicine, Drug Store News, Food Labeling and Nutrition News, Functional Foods, Health Supplement Retailer, Journal of Practical Psychiatry, NACDS Chain Pharmacist Practice Memo, Natural Business, Natural Pharmacy, Nutraceuticals World, Nutritional Outlook, Primary Psychiatry, Psychiatric Annals, The Tan Sheet, Today's Dietician, Today's Health & Wellness, U.S. Pharmacist, Vitamin Retailer Magazine, and Whole Foods. "Nutrition Concerns in Women" by Sarah Johnston Miller, Pharm.D., BCNSP appearing in the American College of Clinical Pharmacy's Pharmacotherapy Self-Assessment Program version IV, 2002. The Wellness Revolution, Paul Zane Pilzer, John Wiley & Sons, 2002. Nutritional Aspects and Clinical Management of Chronic Disorders and Diseases, Edited by Felix Bronner, CRC Press, 2002. The New 8-Week Cholesterol Cure, Robert E. Kowalski, HarperTorch, 2006. You: Staying Young: The Owner's Manual for Extending Your Warranty, Michael F. Roizen, Mehmet C. Oz, Free Press, 2007. Instant Health Answers, Edited by Marianne Wait, Readers Digest Association, 2010.